Leigh, thank you for your post on Carol Dweck and for your assistance with our new adventure. Earlier this year, I investigated a similar idea developed by a person who is a strong advocate for the work of Carol Dweck. His name is James Nottingham and he is a researcher/educational speaker out of the UK. 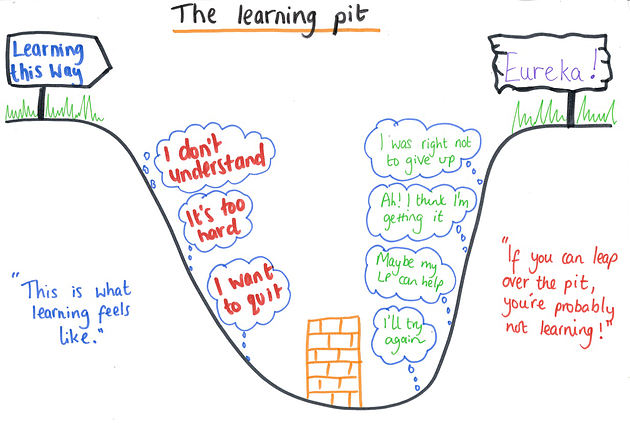 He developed this idea of “The Learning Pit”. It is an excellent descriptor/analogy of the process of deep learning. I am not certain that students understand the process that we go through as we learn new concepts and skills. It is a rather painful, mistake-riddled process. Here is a short video that explains the idea more fully. I thought about how beginning to blog, along with my students and fellow teachers, is a wonderful opportunity to jump down into “The Learning Pit” together. Although learning is something we ultimately do on our own, it is certainly comforting to know that others will be throwing me a rope to help me climb out. Looking forward to our tandem jump into the pit and our collaborative climb out of it!